Fiona Doyle's face was horribly scarred as a child. She writes about her frustrations and dreams in notebooks, penning song lyrics. But she'd never be brave enough to sing those songs in public. Fi Doyle never had an accident. She's the best lacrosse player in the state and can't be distracted by her friend who wants to be more than that. But then her luck on the field goes south. Alternating chapters between Fiona and Fi tell two stories about the same girl—hopes and dreams and crushes, fears and failures and loss. 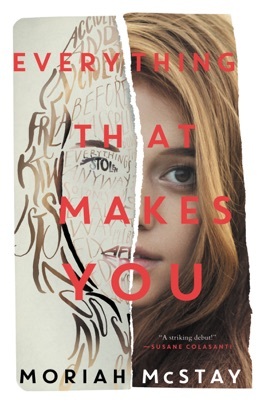 This beautifully written realistic contemporary novel with a twist is perfect for fans of If I Stay by Gayle Forman and Before I Fall by Lauren Oliver. In this thought-provoking first novel, McStay tackles questions of fate, coincidence and the impact of experience in two parallel stories featuring Fiona, a teenager from Memphis. The first story shows how facial scars from a childhood accident have affected Fiona's self-image, relationships, and the activities she pursues. The second story explores how things might have been different for Fiona if the accident never occurred. The intertwined plots, unfolding in alternating chapters, contrast Fiona's encounters with first love (with different boys) and self-discovery as she overcomes various obstacles during high school and her first year of college. While there are some similarities between the two paths (particularly in Fiona's relationships with her parents and brother), the decisions she makes and opportunities she seizes are sharply contrasted. It is up to readers to weigh the physical and emotional traumas and scars that both Fionas grapple with. Entertaining and intellectually stimulating, the novel invites discussion about how much of a person's life is determined by events and whether some tendencies are inborn. Ages 13 up. I wish I could read it for free to write a better review. :/ sorry gals.